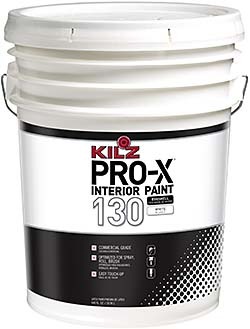 KILZ PRO-X® 130 interior eggshell is washable and best used for applications such as spray, spray back-roll and touch-ups in high-traffic areas and wall trim. The product comes in a 5-gallon can, which covers up to 2,000 square feet. The paint is versatile enough to be applied with a brush or a roller.